Like many other kids his age, a 12-year-old boy took his bike out for a spin in Florida last week. Unlike many other kids his age, that boy hopped off of the bike and stole an SUV from an unsuspecting old man. The boy has more arrests on his record than he’s had birthdays, according to ABC Action News—more than 20 counts to date, many for car theft and his first arrest being at the ripe age of 10 years old. That either means the kid is just an early bloomer (in criminal activity) or he was never told that “sharing is caring” doesn’t mean that you can go around sharing people’s cars. An 89-year-old man was his most recent victim in St. Petersburg, Florida, at about 11 a.m. local time and in broad daylight. The video shows an SUV pulling up to a service station, as a seemingly innocent young boy circles around on his bike. But that’s not exactly the case. ABC reports that the boy coaxed the man into pulling up to the pump shown by saying that a tire was low on the vehicle, executing his plan once the man exited the car. As the car owner walks around to the other side of his vehicle to check on the “low” tire, the boy casually dismounts from his bike and walks over to the driver’s side of the vehicle like he’s done this a thousand times (but really, he’s only done it about 20). 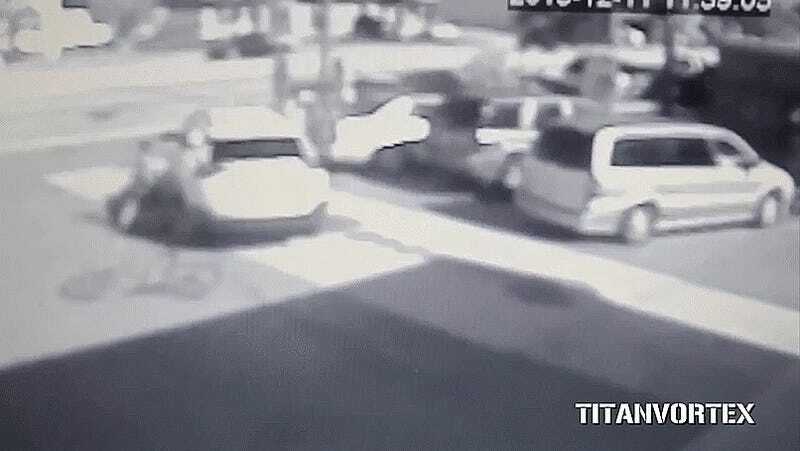 Despite the man being fairly close to the car when the boy gets in, he speeds off and leaves the owner standing, carless, on full display of the surveillance camera. Raftery, who was not injured in the robbery, said he was caught completely off guard. “Broad daylight, in a public place at 11 in the morning and a 12-year-old kid? No. Never even thought about it,” Raftery said. According to ABC, a local detective recognized the infamous 12-year-old car thief pretty quickly—after all, they’ve been dealing with him for a whole two years by now. Police arrested the boy soon after, charging him with grand theft motor vehicle. Santa would plan to give this kid coal in his stocking, but he’s probably already stolen it all out of the poor old man’s bag.